This is absolutely great and something that will make Indian Paypal users really happy. According to latest notification sent by Paypal to Indian users – PayPal merchants in India can now receive up to USD 10,000 per transaction for export-related payments for goods and services, effective immediately. Accept credit and debit card payments anytime, anywhere on your website, mobile, eBay listing, or simply by sending an invoice. Increase your global presence by selling to over 132 million active PayPal users in 193 markets around the world, accepting payments in up to 25 currencies. Leverage on our industry-leading fraud prevention and risk management systems to keep your business secure and minimize losses. We look forward to continuing to support your export business through our global online payment platform. 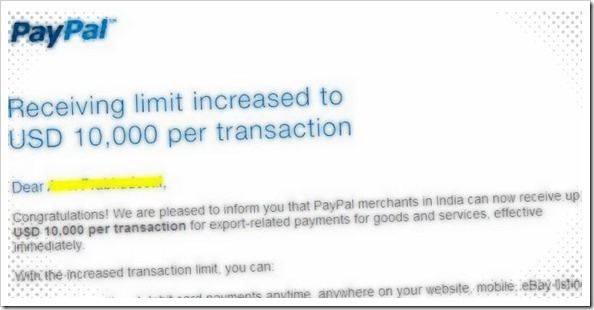 When we first received this email from Paypal, we thought it was some kind of hoax. We checked two or three times to find if it was legitimate. We could confirm from the email, that it was sent legitimately and yes, it came from paypal themselves. However, Paypal has not updated their blog as yet with this information. Generally, these kind of intimations do appear as blog posts on their site. Till now, Indian paypal users were severely affected by the USD 500 dollar limit that Paypal had put for Indian users. Freelancers and small businesses who offered services to foreign clients had to always keep that limit in mind. Though we are quite sure that this mail is completely legitimate, we are still trying to get full confirmation from various sources. We will update this post if we find any change! Smart NaMo: Smartphone By And For Narendra Modi Fans! Yes, I too received at 11:32am today. It surely is a good news.